Question: What do cream puffs, napoleons, éclairs, fruit tarts and Boston cream pie have in common? What’s crème pâtissière you ask? OOH LA LA!! Think vanilla scented, custard-like pastry cream. 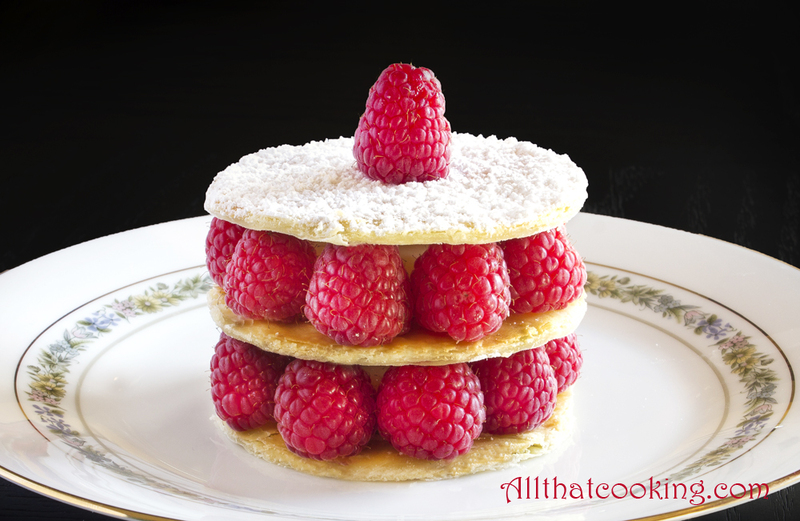 Now, sandwich crème pâtissière between puff pastry and dot some fresh raspberries around the perimeter. . . . Voila!! Raspberry Millefeuille! July 14 is Bastille Day in France, so today’s post is a little lesson in French desserts. You probably know the classic dessert that we call a Napoleon: buttery, flaky pastry leaves layered with custard cream, topped with a delicate icing. Well, never ask for a Napoleon in France. The French simply won’t know what you are talking about. However, if you ask for millefeuille you will be presented with a delectable dessert made of three layers of puff pastry, alternated with two layers of crème pâtissière, crowned with yet another pastry layer that’s lightly iced or dusted with confectioner’s sugar. Mon dieu, what a dessert! Melt in your mouth pastry with a buttery crunch, smooth and velvety vanilla custard and sweet/tart raspberries. Only the French could come up with this perfect contrast in textures and flavors. This is not difficult to make. You just have to be careful when making the crème pâtissière. 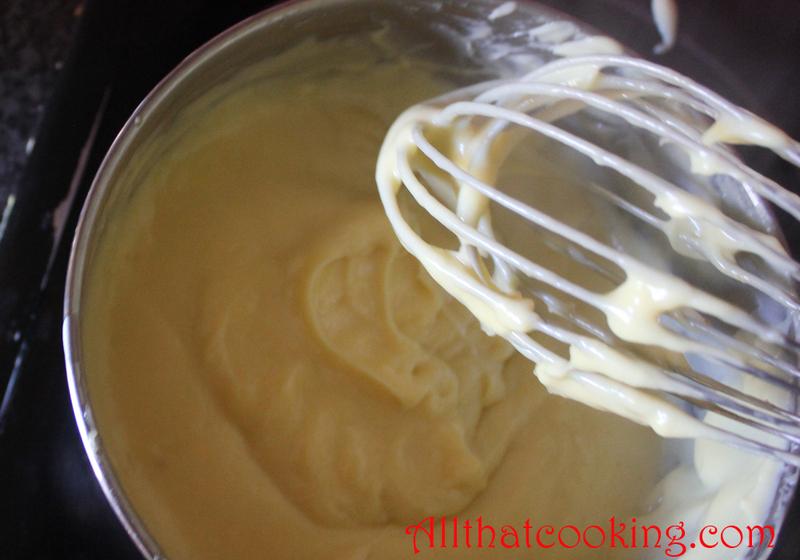 It’s a basic recipe and we plan to post more recipes that utilize this versatile creme. (Think soufflés and cakes . . .) Oli made a great comment about crème pâtissière. “It’s just as important in the bakery pantry as stock is in the kitchen pantry”. Why not add it to your culinary bag of tricks? Start by making the crème pâtissière. You can make this the day before if you like. There is a bit more crème than needed for this recipe, but it is difficult to make a smaller batch since it’s a sensitive process. Any complaints about extra crème?? 1. 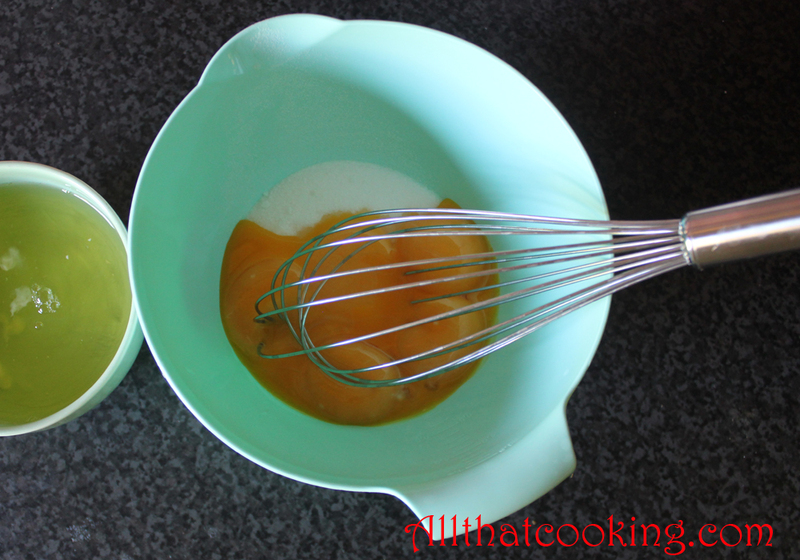 In a large bowl, whisk together egg yolks and 1 tablespoons of the sugar. 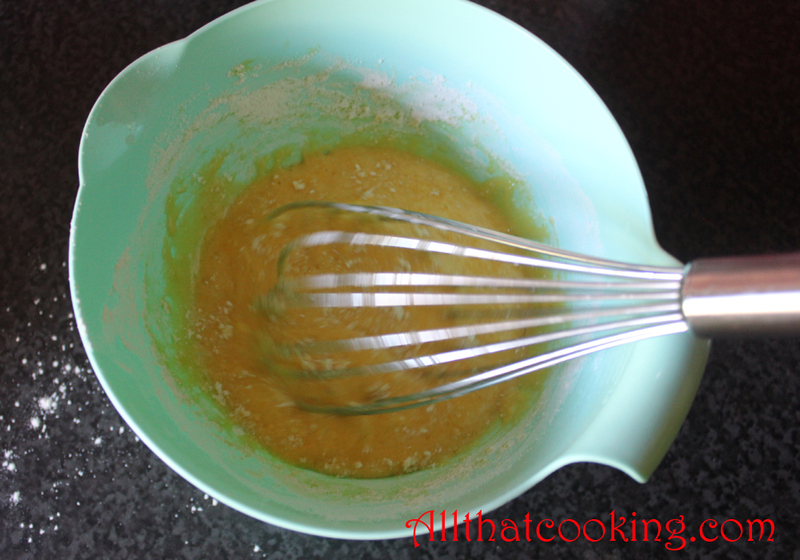 When combined, whisk in flour until smooth. No clumps allowed! 2. Pour milk and vanilla into a medium sauce pan. Sprinkle remaining sugar over the surface. Do not mix. Bring to a boil over high heat without stirring. The sugar will settle on the bottom and keep the milk from scorching, because the milk will boil before the sugar melts. 3. 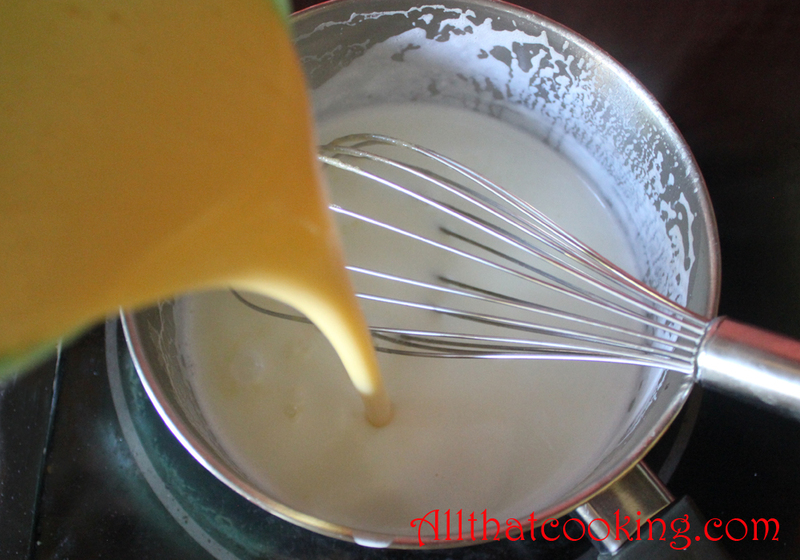 When boiling, whisk half of the milk into the egg mixture. 4. Return the milk pot back to the burner and reduce heat to medium high. 5. 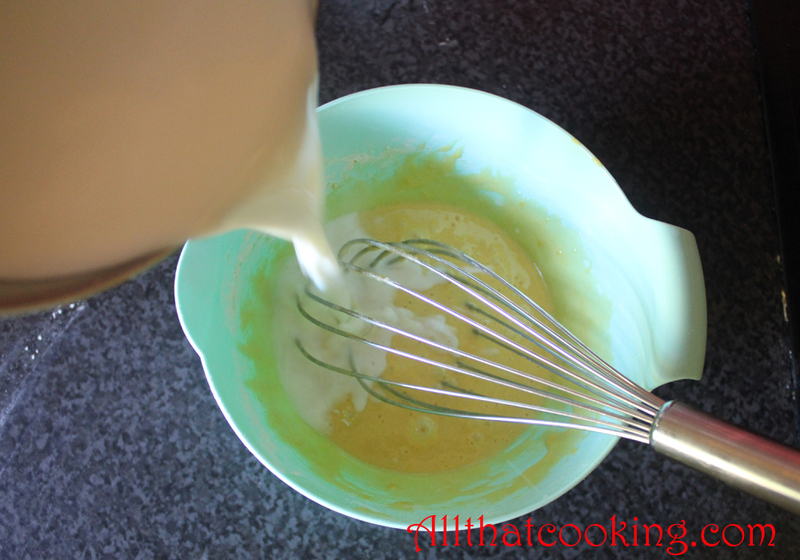 Whisk egg/milk mixture from the bowl into the milk in the pot. 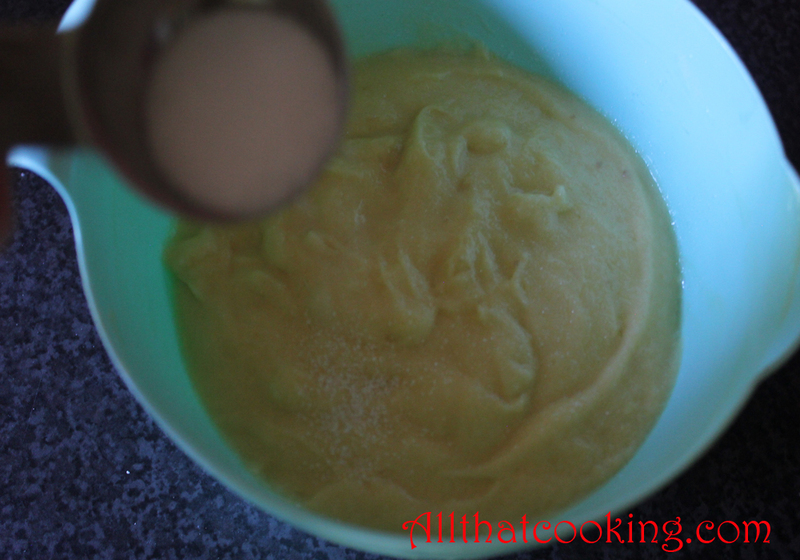 Bring to boil and let cook carefully for 2 minutes while constantly whisking. Keep it simmering. You may have to take the pot off the burner and return it to the burner a few times to keep the simmering constant. The crème should cook but not boil. Just remember to whisk, whisk, whisk and whisk some more. 6. After 2 minutes you should have a thick crème. Pour crème into a clean bowl. 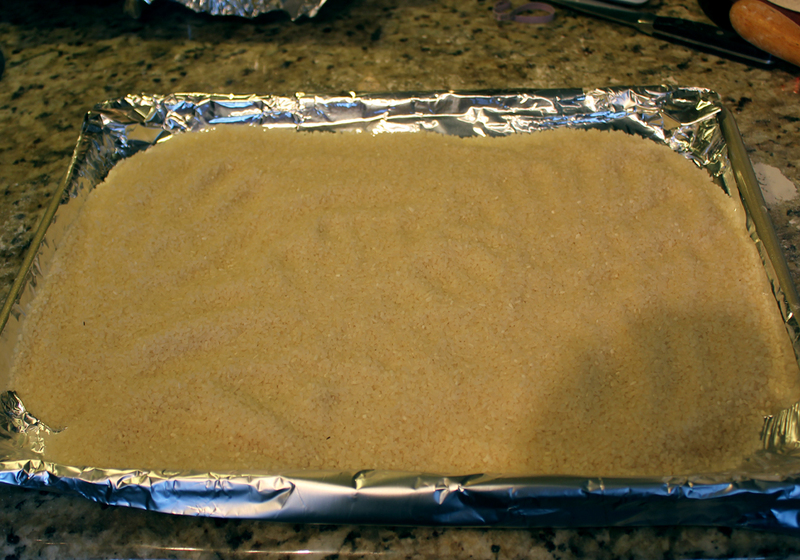 Sprinkle 1/4 tablespoon sugar evenly over the surface. This will prevent a skin forming on the surface. Cool to room temperature before covering with a plastic wrap. Refrigerate. Crème can be kept for up to 4 days in the fridge. 1. On a lightly floured surface, roll out dough to about 10-inches by 16-inches 1/8-inch thickness – it should fit nicely onto a cookie sheet. Use a fork to prick the entire sheet at about 2 inch intervals. 2. 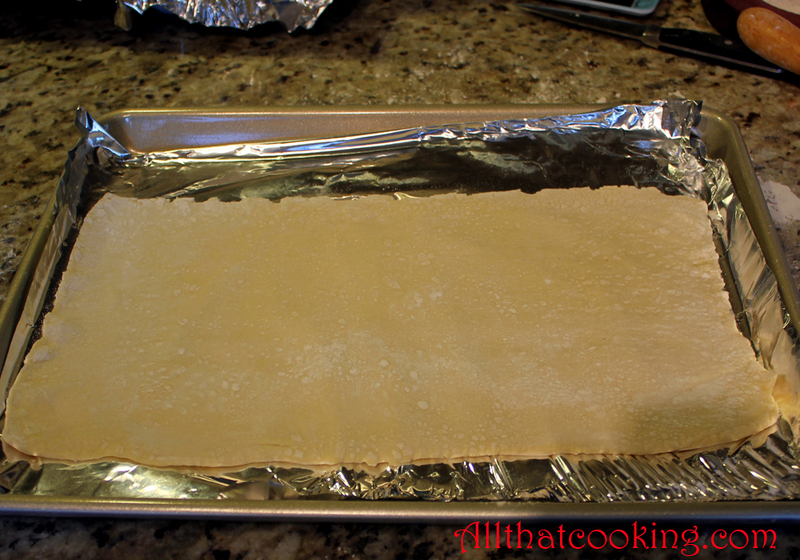 Place dough on an aluminum foil lined cookie sheet. 3. 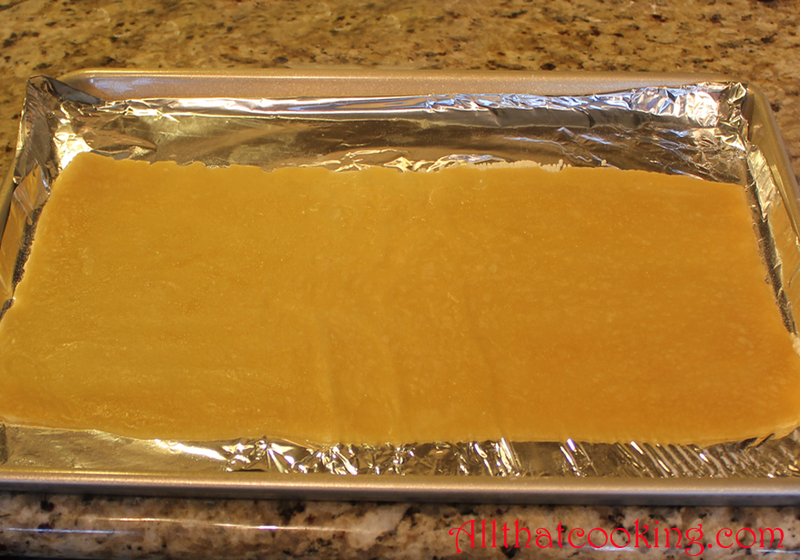 Cover dough with another sheet of foil. 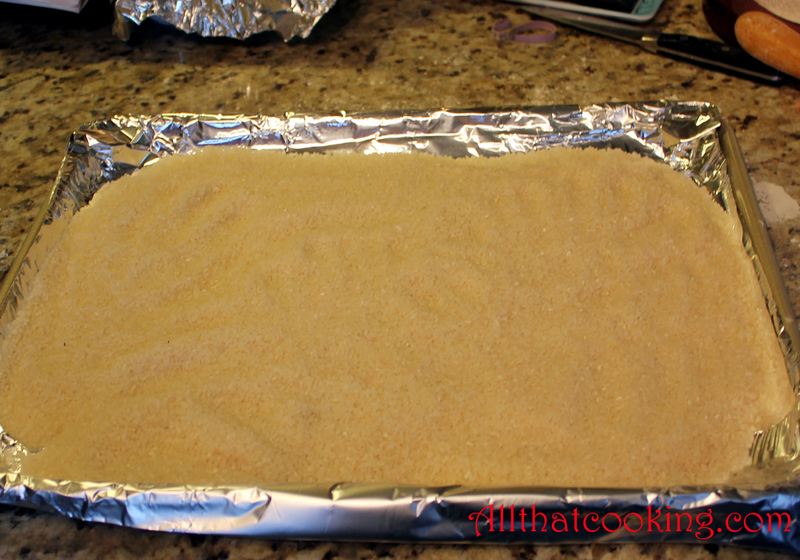 To keep the pastry from puffing up, evenly spread rice onto foil . 4. Remove tray from oven. Carefully remove the top foil with rice. Keep it nearby. You will use it again. 5. Carefully turn over the dough and return to tray. Top it again with foil and rice. 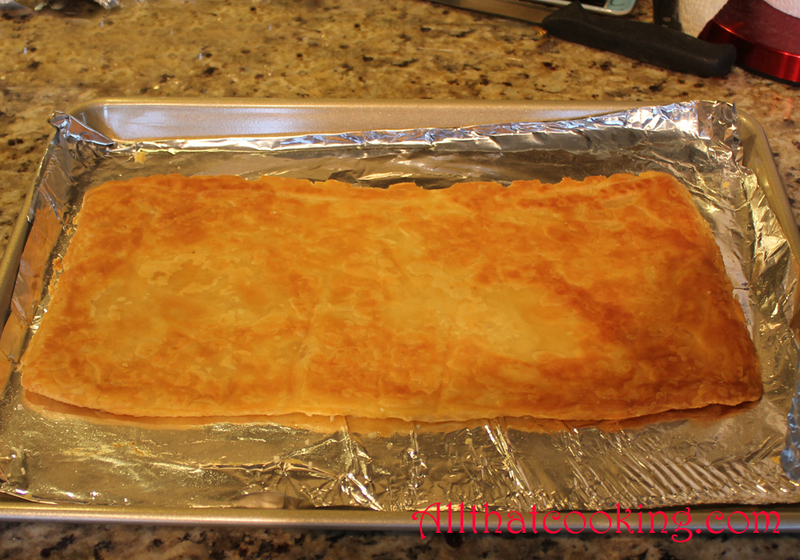 Cool this beautifully baked pastry sheet to room temperature. 1. Cut pastry into 12 rounds that are a little bigger than 3 inches. A large biscuit cutter would work nicely. 2. Place one pastry round on a serving plate. 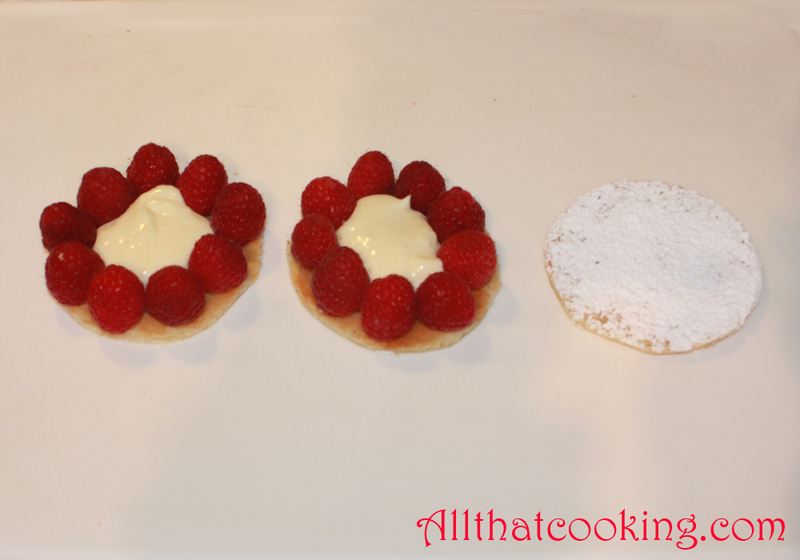 Arrange raspberries around the edge of the pastry, then spoon or pipe crème pâtissière into center. 3. Top this with another pastry round. Arrange raspberries and crème as you did for the first layer. 4. Finish with another pastry round. Dust with confectioner’s sugar and raspberry. Gallery | This entry was posted in Desserts, Sweets and tagged creme patissiere, fresh raspberry dessert, napoleon pastry, puff pastry dessert, raspberry Millefeuille, raspberry puff pastry dessert, vanilla custard filling. Bookmark the permalink. Thanks ! You have some great posts yourself !